This is a really good first-course pasta which has a richness of flavour without being heavy. Use a good quality, aged balsamic vinegar (if you don’t you might need to use a bit extra). Heat the oil in a large pan and gently fry the garlic until light brown. Add a few basil leaves and then the tomatoes. Stir and cook gently for 30-40 minutes or until the sauce is reduced and thick. Season with salt and pepper and add the rest of the basil. Cook the penne in lots of salted boiling water , drain thoroughly and return to the saucepan with the butter. When this has melted, add the balsamic vinegar and toss over a gentle heat for a few seconds until the penne are brown. 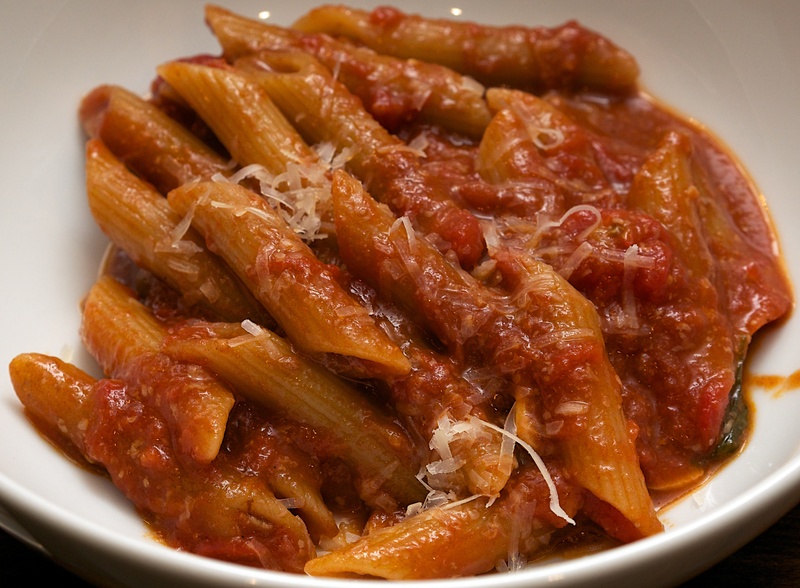 Throw in a handful of the Pecorino, then stir in the tomato sauce. Serve with more Pecorino. Wine Suggestion: Pairing a wine with this dish is not as straight forward as it may seem as you need a wine to balance the rich flavours, acidic tomatoes and sweet and sour vinegar. One option is something from the Marche with a combination of Montepulciano and Sangiovese. Alternately look for a very good Valpolicella or Ripasso, but make sure it is one with a bit of freshness, tannins and elegance. Another option, which we tried to good effect, is Barbera where the fresh acidity and softer tannins complemented the dish excellently.